We know without a shadow of doubt that blogs networks still work and they work REALLY, REALLY well, (and if you don't know that, don't just take my word for it... Read what some of the other SEO Professionals have to say about them at the bottom of this page). In fact, Google has a hard time figuring them out, which is why they actually hired staff to become members of high profile blog networks (yes, we have proof of this)... They did it with the sole intent on searching and destroying, leveling the playing field with those who don't do SEO. Well, we all know what Google actually did... They forced the "real" businesses that cared enough about their business to do SEO, off of organic search by penalizing them... which forced then to rely on Google's paid advertising programs (Adwords) to stay in business! Afterall, Google's a business too, and that's how they make money. Good for them. BAD for us. And with all of those recent updates, we've all become more concerned of the health (i.e. 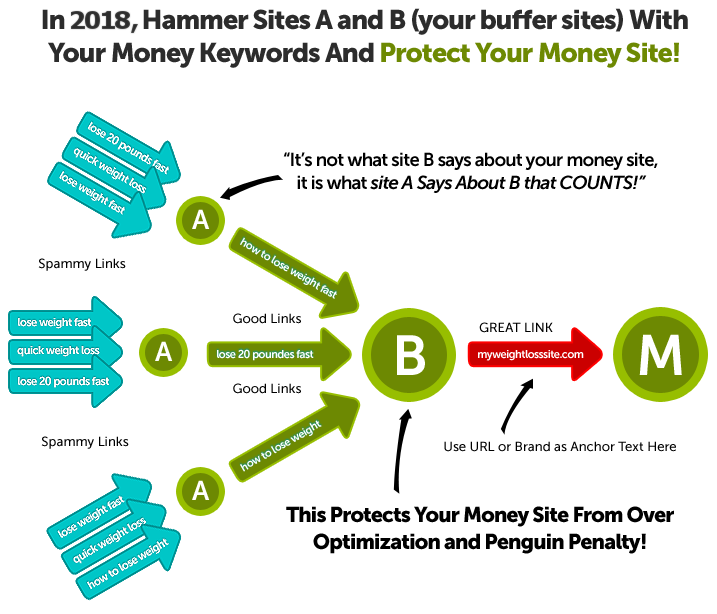 quality) of the sites linking to our "money sites" as well as the anchor text we use... so we don't over optimize our money sites... and get penalized. I talked about this back in 2007. This is taken directly from one of my slides about what was new in SEO in 2007! 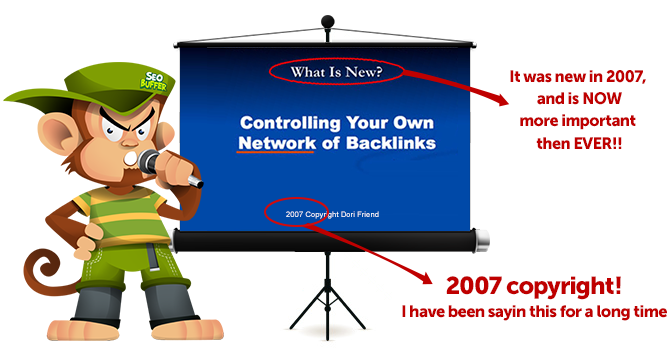 And I said the same thing then... "Controlling Your Own Network of Backlinks." And it rings more true today than ever before. NOW, not only do we need the power from a traditional blog (link) network, but we need to be able to protect our money sites as well. Bottom line, networks are valuable because it is LINKS that make your sites move up the search engines... plain and simple. And yes, you have to have good On-Page optimization to stay out of Panda's reach, but it is still about links. Here's another old slide explaining what a "link network" is. Then, on the note to the side, I explain how they came to being called "Blog Networks." Now that you understand what a blog network is, why they work so well, let me explain why and how do they protect your money site. Back in 2009-10, whenever we had a site starting to tank in Google rankings, I'd switch up our linking anchor text to use the money sites URL and other natural phrases like "click here," "visit," "for more info'" to counter balance the over-optimization that I experienced with hammering my site with too many "money keywords" as my anchor text. So, it should of been no surprise to me in November of 2011 when I started to think that "anchor text diversity" was starting to have a bigger role in ranking. We developed a script to help us examine my "anchor text ratios." If I was noticing it... we can be pretty confident that Google was already starting to use it. I had no idea then, how important "anchor text diversity" was about to become, but we started to see the first real rumblings of this in Dec 2011 - January 2012, and then on February 27th, Panda 3.3 hit and among 40 different things they changed, there was 1 little paragraph about turning off a link qualifier. On this day, sites started to tank in masses. Everyone who had been doing "best practices" of SEO seemed to be hit and hit HARD! Below is only 1 screen shot of the dramatic devastation that occurred. I have many, but for the sake of space, I think you get the picture. Something was definitely wrong... across the board. On April 24th, Penguin 1.0 was released and Google declared war on "web spam" and another round of sites using "over-excessive" amounts of exact match keywords tanked further. An "exact match keyword" is the keyword we would use in our anchor text (link text) because it was the keyword I wanted to rank for. For example, back in the day, we could hammer our weight loss website for a keyword like "lose weight fast" ... until our little weight loss website was ranked #1 on Google for "lose weight fast". Well, you can imagine what our "link profile" looked like! There were no anchor texts with our "Brand" or "URL" keywords in it. No anchor text with "click here" or "visit" in it, because I didn't need to back then! I just hammered away building links to our money site (our weight loss site). We all did that to our money sites, it was "best practices" back then, so don't feel bad! And, here is the beautiful part of the story.. So here's the reason I tell you all of this. If I had HAMMERED the keyword "lose weight fast" to a "buffer site", our weight loss site would NEVER have gotten penalized and would still be receiving the juice of those anchor text links like it was 2010 all over again!? In other words, if all those links saying "lose weight fast" were pointing to Site A, and Site A is pointing to Site B, then Site B gets the benefit of what the links say that are pointing to site A! 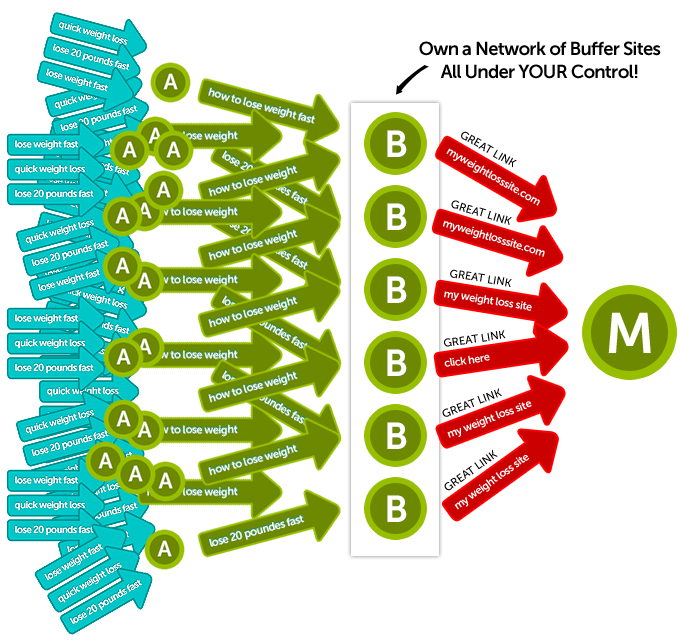 Essentially, Sites A and B act as a "buffer" for your money site! And THIS is how to protect your money site! Do NOT hammer away at your money site like we did back in the day. Those days are long gone! Take a look at the diagram below. A picture paints a thousand words. And of course, I know some people who go 3 and 4 layers or more with this. Now, back in the day we used to only care about Trust Flow when we created buffer sites. It was all about passing Trust Flow, but those days are long gone as well. I've examined hundreds of sites, if not thousands, and one thing I do see in common with sites that ARE ranking, is that the links coming into them, no matter if they are from even spammy sites, are THEMED!! And of course, there will be exceptions to this, just like with everything. So please take this just as that, a generalization of what I have seen in the last year. The internet obviously made up of a lot of crappy sites and crappy links, and that is normal. What isn't normal, is a site that has had NO SEO done. A site that's getting a lot of links with only "money keywords" as anchor text. When Google sees "money keywords" in abundance coming into a site, that tells Google that that site is doing SEO, and Google HATES SEO!! (Oh and by using the Disavow Tool or asking for reconsideration for linking, you are saying, hello, I was an SEO spammer! And you know what Google does to SEO Spammers! Just to remind you, ANYTHING you do to try and manipulate the search engines (which is the definition of SEO) is against Google's terms and conditions. So, if you are going to do it, and yes I am still going to do it, then I have to be stealth about it. Don't stop there, continue to build your network and drip in powerful links from the addition of more and more sites. The most beautiful thing about this is that you can add more money sites any time you want. 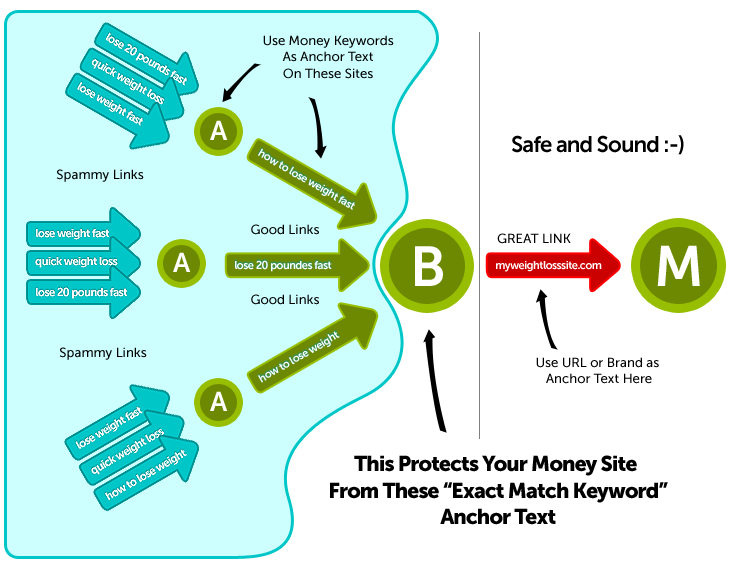 You are in complete control of your linking, your anchor text, all the while keeping your money site SAFE! We have been building link networks since 2003, we know what works and what doesn't work. (Remember, we even spoke about building these things back in 2007!) And, we have been teaching other SEO'ers how to build them ever since, so I guess you can say this IS our area of expertise and there is no one... NO ONE, that can build them better for you. We have systems and staff standing by to get started on YOUR network ASAP. So we can do the hard part. 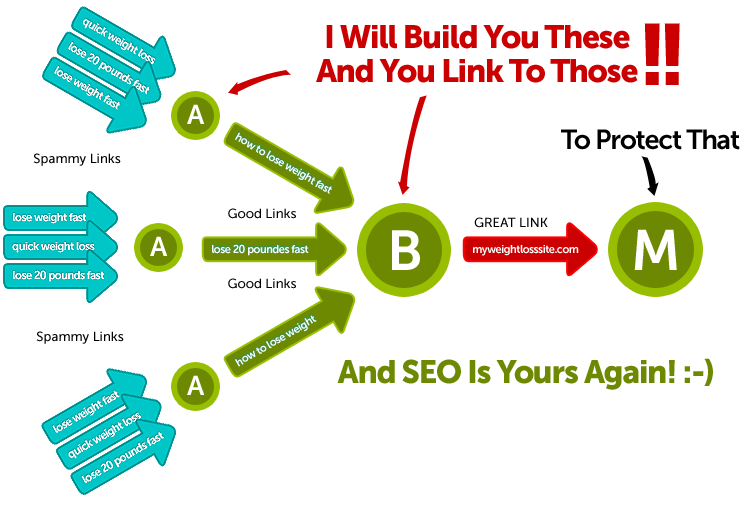 All you have to do is get into one of the linking programs that are open and link to both the sites I build for you, AND the sites that are already linking to them to make them stronger. And really, you don't even have to do that. These sites have age and are themed to your market with themed links coming into them. But, to make them stronger, I would recommend continuing. These sites are built to not only add value to the web, but to pass a manual review if one ever came your way. But these sites WON'T even come up for a manual review because... Hello, no one else is using them, so they are NOT going to get turned into Google. Different Website Platforms so they all are NOT on Wordpress! (unless you specify WP only) Wordpress now constitutes a little over 15% of all websites and is incredibly easy to use, but, it is also what traditional blog networks have used and many people believe that WP may take a hit in the future, therefore, we are offering multiple platforms to make it not only look more natural but to protect you in case WP ever did get hit. A wide variety of different themes and templates for beautiful looking sites that are eye catching and unique in combination with the below. We add more themes and templates everyday into our libraries. 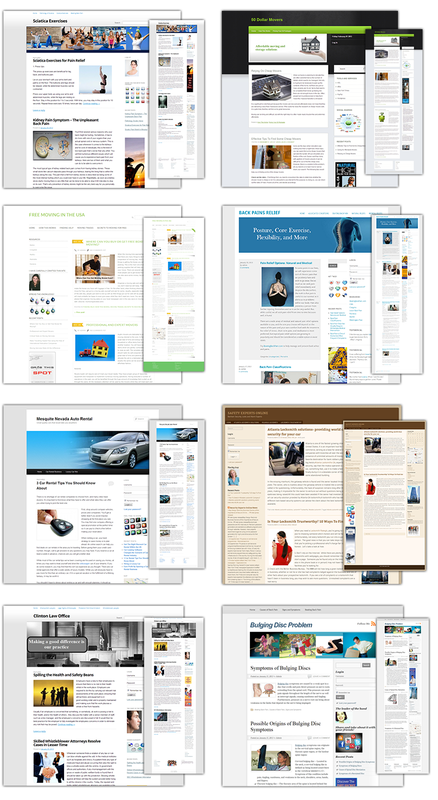 A wide variety of different widgets, modules and or extensions to make each site useful, valuable and unique. We incorporate the most popular add-on's in different combinations depending on the theme and market of the site. For example, A real estate site may get a loan calculator that would not be appropriate for a Dental site. Contact Pages With Name, Address, Email and Phone Number! NOT just a "contact form" which is another Google no, no. If you have had a chance to read any of the Google Manual Reviewing documents, then you know Google is looking to see "who is responsible" for the site. Contact forms have been long used in blog networks and therefore are called out in the documents as "not good enough" and recommend flagging the site because of it. Themed American Written Non-Spun Articles and News Feeds from Our Libraries. We have proven that the page only needs to be 51% original for Google to deem it original content, so we use articles in our library for your content, but we do so in a way that makes the page more then 51% original so you are good to go. Really, the toughest part of owning a public blog network has been customers. Yes, customers turning themselves into Google. In the past, when they get an un-natural link notice, (which is more likely from directories and sponsored links, NOT blog networks!) they freak out, confess and lay it all out to Google! That doesn't do ANYONE any good. It isn't good for the person who is so scared that they sacrifice themselves. It isn't good for the blog network owner, and it certainly isn't good for the other customers in the blog network. Thus, my networks, are closed to beginners, and very limited to even advanced people. We only let in 10 people per 100 sites at this point. It's just too dangerous to open them up for just anyone anymore. And, since we have been building blog networks since 2003, I know a thing or two about them! And, you are going to get the results of all the years of trial and error, this update, that update, what is working now type of sites. These sites will NOT be hosted in one data center like MOST seo hosting leaving an HUGE footprint. In fact, seo hosting in general is a no no just for the sheer fact that Google now knows these hosts, their IPs and has them in their cross-hairs. These sites will NOT have links coming from "sponsored" or "advertisement" slapped on or above the section of them. These sites will NOT be purchased in the expired domain auctions "just" for their Authority and turned into something off domain topic just to pass Trust Flow. You can always give a domain Trust Flow but what you can't give it is theme and AGE! These sites will NOT be shared with anyone else (unless you do) so you do NOT have to worry about other customers turning them into Google as the sites they would like to disavow links from. These sites are YOURS only. These sites WILL be hosted in regular mom and pop hosting services all around the world in shared hosting accounts just like what real everyday people use. Because guess what... These are real everyday sites that blend into the background just like we want them to do. These sites WILL have contextual/editorial links like the ones Google loves to hate because they are so dang juicy and pass the absolute most benefit your site. These sites WILL be purchased in the expired domain auctions themed in YOUR market and YOUR niche. They will then be linked to from various sources with their URL as the anchor text to pass Trust Flow and more authority. These sites WILL only have links to YOUR money site and other major authority sites (e.g. big sites like about.com and such) as THAT is natural. These sites WILL have articles and content that will have NO links in them making out outbound linking ratio low thus supping up the links that ARE going out. 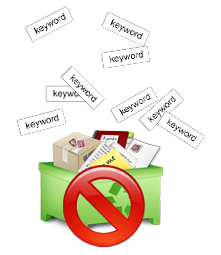 These sites WILL only link to your money site using your URL unless you specify different "money" keywords. You will literally get these things delivered to you already working, already linking, already themed! Already Perfect! And, your network will grow over time and you will benefit from drip feeding your money site with reputable themed links from within themed content. 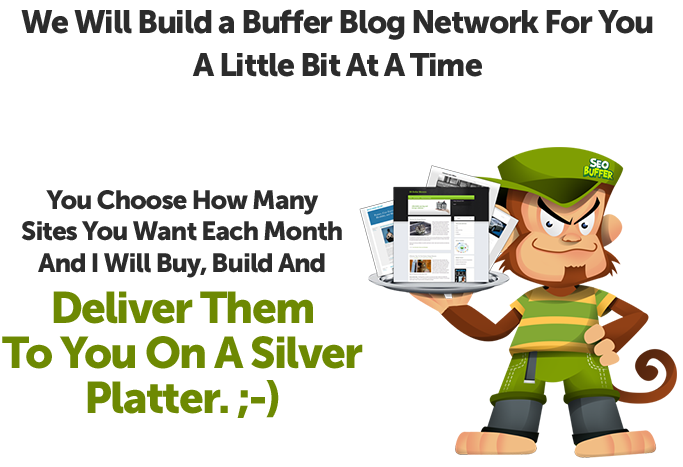 It is the most painless way to grow your own blog "buffer" network, dripping them in naturally gives you the best of both worlds and makes your money site increasingly stronger. So what happens when Google changes SEO up again, well YOU have CONTROL of all your links to do whatever needs to be done to them be it changing anchor text, taking them down, adding more... whatever! It is all in your control! And, your money site is protected! Will these sites have Trust Flow? YES, but because we are buying them for the theme as well, it is hard to predict how much Trust Flow we will be able to grab. But we make our absolute BEST effort to get as much Trust Flow for you in the niche you have chosen. It may be necessary for us to come back to you however and ask if we can broaden the niche so we can get a site with good Trust Flow. Will you host these sites as well? No, even though we have set up hosting for you, you will need to acquire the hosting account as we strictly are site developers and need to leave the longevity of your sites to you. I can't. The only thing I can guarantee is that we take all precautions while buying, building and delivering them to you. We will give you "best practice" guidelines to follow to keep them as safe as possible and it is your responsibility to follow them. Yes... And No. If we don't hit the mark in your niche for your first time around, then yes you can be clearer as to what you are looking for. Just keep in mind, we are at the mercy of what is available and if your request is too narrow, then it may be more like looking for a needle in a haystack. We do our best to find exactly what you are looking for, keeping in mind what would be a natural link to you from these sites. For example, if you are in the auto transport business, it would be natural for you to get a link from a real estate site that has recommendations for moving. Yes! We have pricing available for that here. Can you make sites on other platforms than WordPress? Yes, we can make html sites but let us know if you want those as for some people they are harder to manage putting content and links on. Can I get all of my sites on WordPress. Yes and recommened when first starting out just for ease or use. But if you are getting up to over 50 sites, then you should think about getting some html sites. Will I have access to these sites to add articles and links? Do I have to find my own hosting. I used to charge $500 for each and every one of these sites... or $997 for 3. The fact is, the administration is such a pain, I stopped selling them all together in about 2014 and just concentrated on building and selling access my own blog networks. And, since I am now closed and it doesn't look like a HUGE opening to the public is going to happen any time soon, I figured I would put my systems and talents to work for YOU! But it is still costly because I have the actual cost of BUYING the site, and labor that went into finding it, and then the labor for administrating and building it in addition to that cost for the content we use. Here is the breakdown of what I do.. But even though it is lot of work, like I said, I have been doing it for so long, I have staff and systems around it that make it comfortable for me to do it, but it's still not cheap. So, depending on how big you would like your network to be, figuring you will stay in for at least a year, how many sites will you want at the end of that year? Or how many do you want to drip into your network monthly? 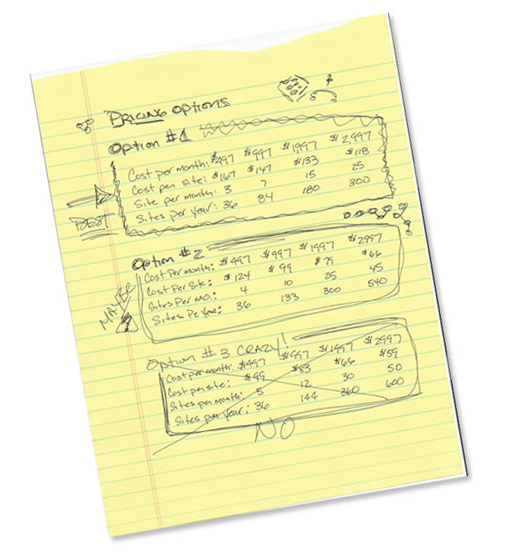 I really did have a difficult time figuring out my pricing structure. Below are the notes from my brain and how it varried. On one hand, I didn't want to price too high not to get any sales, but on the other hand, if I priced too low, people might not get the value and painstaking effort that goes into each site. But then there is a part of me that wants to beat Google more than anything else right now for all the chaos they have caused in my life, as well as all of my friends and every SEO out there! If I can get these and this technique into as many SEO'ers hands out there, WE would have control again and NOT Google, and that makes me happy. Considering all of that, I have set up a few packages to make it worth my while and keeping it incredibly low enough for everyone to jump into blog network ownership that is a serious SEO player. Well, I did do the artwork for Option #3 and it is below, as I did think I could do the sites at this price before affiliates on board, so essentially, I am giving YOU the affiliate's commission! And I still think I am crazy and I reserve the right to increase these prices at any time I want! LOL! 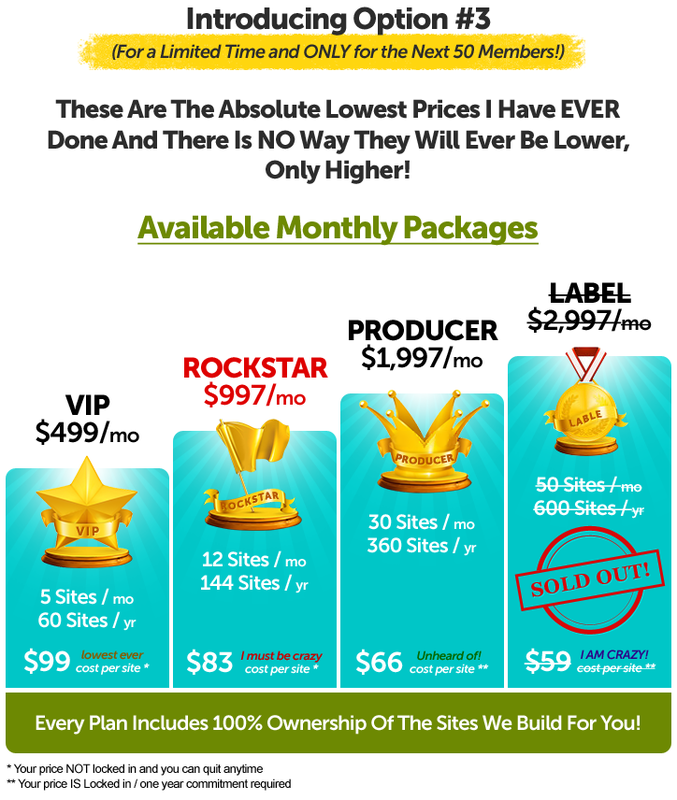 The only packages that you can lock your price in for one year is the "Producer" and "Label." The others I only guarantee the price when you order it. I don't plan on raising the prices any time soon... But I WILL raise all of these prices once I open this up to affiliates and even possibly before that. It isn't like there is an infinite high-quality supply of expired domains out there to create these sites with. I don't say this to give false scarcity but there are only SO many domains expiring in "each market" everyday and the quantity varies... so for me to be able to pick up the best sites for everyone, I will only be able to take "a couple people per market." It depends on the market as there are a lot more sites in the Real Estate industry than say Candle Making. Types of Sites We Purchase For YOU! What Type of Sites Do You Want? Every SEO has different goals and requirements. So to make it easier for us to fit into YOUR system, we are now developing sites in the following ways..
After you purchase your package below, just let us know which of these three types of sites you'd like us to set up for you, and we'll get to it! This is a site that domain name and site archive are in the niche of your choosing. 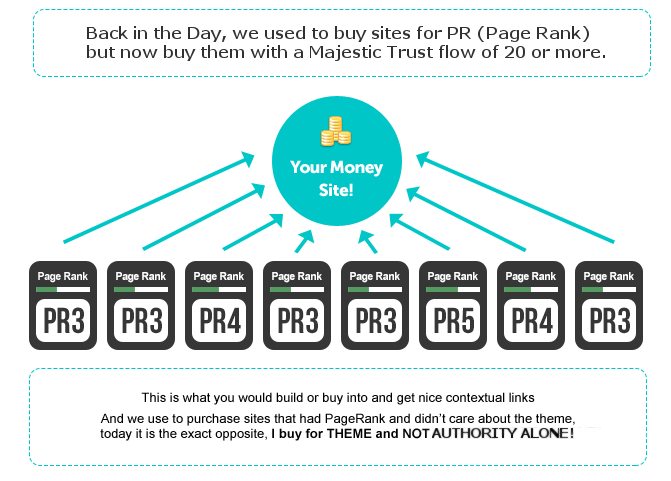 This is considered the best way to go when building a PBN, but it also reduces the Trust Flow (site authority) that we are able to find for you. This is a site that is primarily purchased for quality of Authority and or backlinks and trustflow. Re-themeing currently works GREAT at tier 1 buffer sites, and there could be a time that it doesn't. So a little more on the risky side. 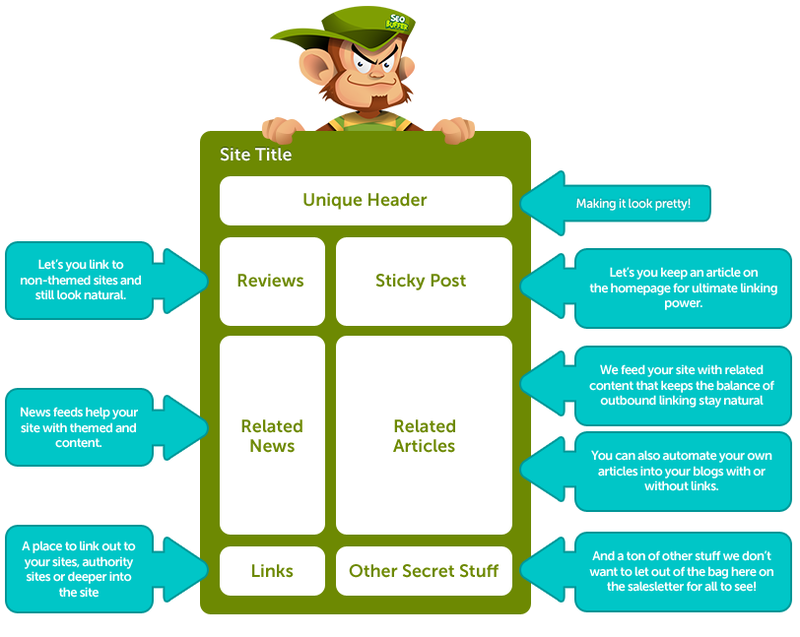 But for those would would like us to ALWAYS buy for "site quality attributes" regardless of theme, then this is for you. With that in mind... what are you waiting for? 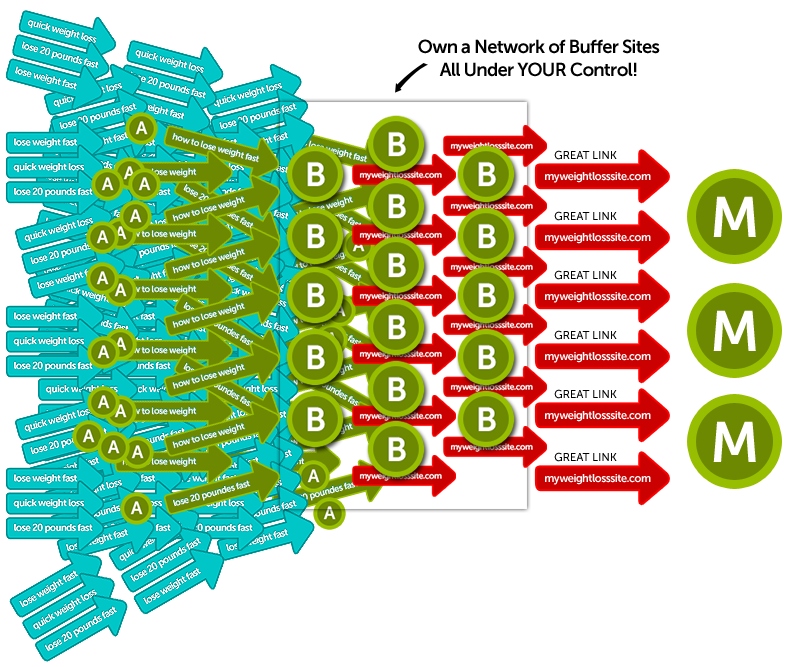 Let us build YOUR Private Buffer Site Network FOR YOU! For the Internet Marketers and SEO'ers who want to get their feet wet and start attaining online link real estate and protect their money sites. You will get 5 Buffer Network Sites delivered each and every month and painlessly grow your link network empire. At the end of the year you will have 60 sites and at the end of two years, 120 and you wil be a force to be reckoned with. Every month you will receive aged, reputable, themed sites to add to your online arsenal. You will no longer be at the mercy of other webmasters, but in control of your own SEO. For the Serious SEO'er who knows that they need a blog network and loves the idea that this will also protect their clients sites! 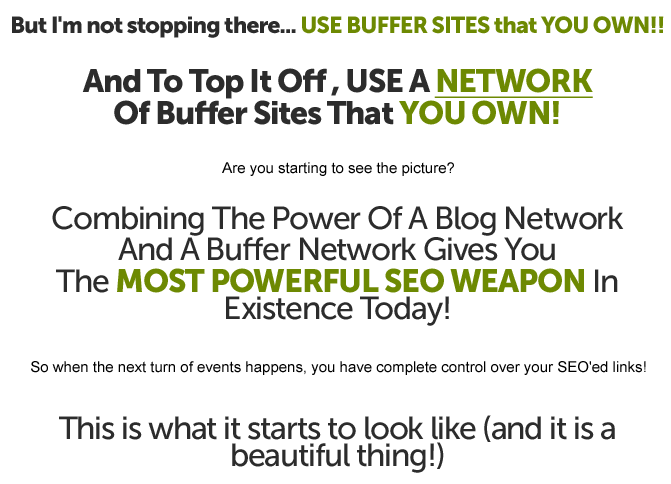 You will get 12 Buffer Blog Network Sites delivered each and every month, and painlessly grow your link network real estate. At the end of the year you will have 144 sites and at the end of two years, 288! We opened our first public network with only 200 sites, just think of the power you will have at your command! Every month we will add to your SEO arsonal. You will no longer be at the mercy of other webmasters, but in control of your own SEO and online empire. For the Professional SEO that has mulitiple clients and multiple markets. The price tag is a drop in the bucket for you because you know the ROI it will yeild. You have been wanting to build this for a long time but you just never had the time or patience to build it yourself. You know that the 30 sites/month is going to make your SEO business skyrocket as you continue to drip reputable links from sites in while protecting your client's money site. At the end of two years, you will have 720 sites!! 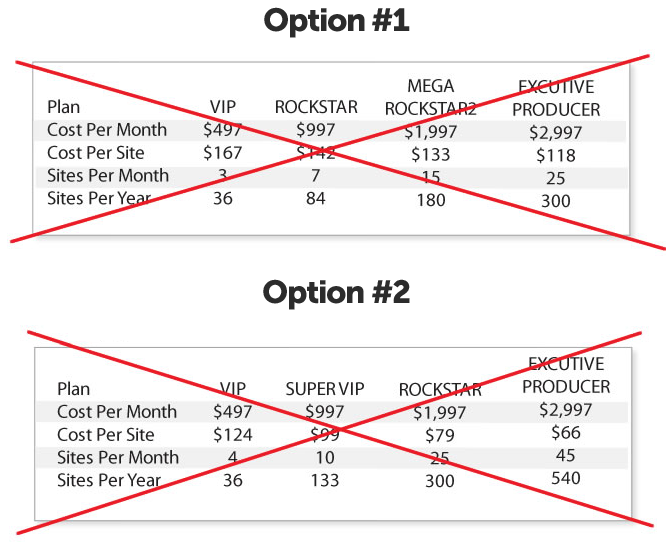 NOTE: These sites are OPTION B only as it is too tough for us to find 30 themed sites per month. "Ranking #1 for nearly ALL my keywords...And my Income has TRIPLED in the last 2 months!" Ever since you built me an SEO Buffer network my rankings have literally gone from ranking somewhere NOBODY would find me, to ranking #1 for nearly all my keywords! And my Paypal balance has TRIPLED in size in the last 2 months, alone! "I Have Had The #1 Position For Over A Month And It Hasn't Budged Once!" Not only have my quality backlinks increased dramatically, my rankings on all Glossary Link keywords I have used on the network have increased. One of my best converting keywords I used to have to fight to stay in the top 3 - 5 spot, since joining, I've had the #1 spot for over a month and it hasn't budged once. Good stuff! 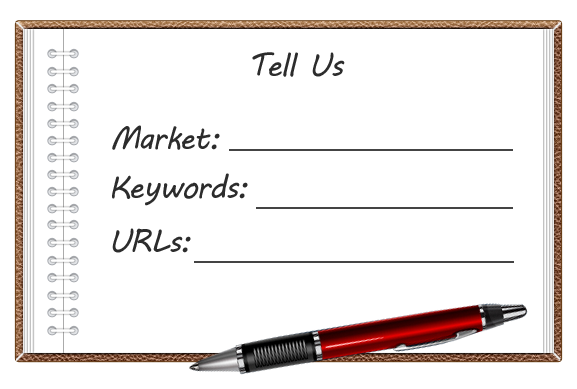 "My money site is on the 1st page of Google for the keywords I wanted to rank for....ALREADY!!! WHAT? IN 1 WEEK!!! " to be completely isolated in order to have clean results. So I used my PR0 website. After doing little on-page optimization and using your system, I just checked my ranking stats and my homepage of my money site is on the 1st page of Google for the keywords I wanted to rank for....ALREADY!!! WHAT? IN 1 WEEK!!! This is crazy! Thanks guys! "It's INCREASING my rankings in Yahoo and Bing!" It's interesting - my buffer sites have not been up very long at all... and already, it's increasing my rankings in Yahoo and Bing for my Pharmacy Drug site! "... They look fantastic! You Guys Rock!" I got my first batch of buffer network blogs and they look fantastic! Thanks for offering this service. You Rock! "My website has started to appear on page 1 already!" Impressive indeed! Go ahead and charge for the next five sites! My "detailing" website has started to appear on page 1 for some keywords already. "I Rank #2 For My Primary Keyword And #2 For My Secondary Keyword In Under 1 Month!" Your service is hands down the easiest way to create Glossary Link back links on demand. The auto drip feature works great for my larger Glossary Link authority sites when I want a set it and forget it linking campaign. For my smaller Glossary Link niche and seasonal based sites the ability to log in to any of a the hundreds of sites anytime I want and create links is not only fun (from an SEO perspective), but it is very effective as well. For one site, I registered a Glossary Link domain on September 9th for a Halloween Glossary Link promotion. It is now the 16th of October, a little more than a week before Halloween and I rank #2 for the primary keyword and #1 for the secondary keyword as well as in the top 5 for a couple more terms. This site that is a little more than a month old is currently getting 178 targeted visitors a day. I consider this a perfect result for a niche Halloween promotion and I could not have had this result without the service. Aside from being a powerful way to build back links on demand, the support team is in place to ensure I get the most out of my subscription. Keeping me up to date on new features and ensuring I am using them to the best potential. A great service offered by a team that takes pride in their product, and they should. It works! 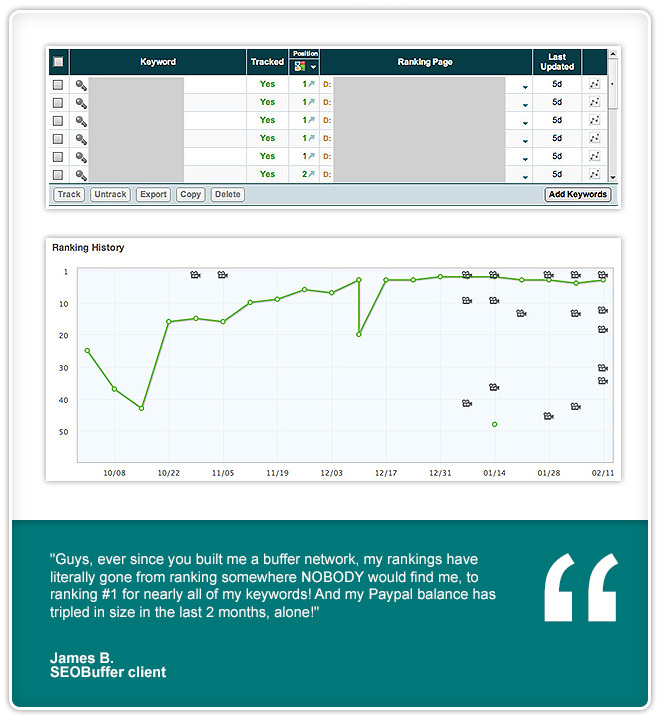 "Easily The Most Powerful SEO Tool I Have Ever Used!" EASILY to most powerful SEO tool I have ever used. I used to have to Glossary Link search for, beg, borrow and steal links from any and everywhere I could find them, but now I just have to enter my text and I get as many links as I want. I have been an SEO professional for five years and it used to take me months of tedious mind numbing Glossary Link link gathering to get first page results in Glossary Link Google for mine and my clients Glossary Link search terms. But now, (in the words of the immortal Ron Popiel) I just "set it and forget it" AND I STILL GET PAID! The only difference is now I play golf, go to the lake, spend time with my family, whatever. I don't' have to sit at my computer begging for links all day. Dori takes care of that for me and I just reap the rewards! It so easy. I watched the videos and they explained pretty much everything. But if I have a question about anything, I almost always hear back right away or the same day. I've tried a lot of different SEO programs and software out there, but I can guarantee, I'll be here until the day I die, this program ROCKS! Copyright © 2018 SEOBuffer.com. All Rights Reserved.